Nice job on this application! I have one question that so far has me stumped. When configuring coupons in items it seems that the price of a taxable item is reduced *before* the tax is calculated. In my area the price is reduced by any instant rebate or coupon amounts only *after* the sales tax has been calculated. I even tried to work around this by configuring an item that has a negative price (such as “BJs Coupon -5.00″ with a price of -$5.00 or an instant rebate for a specific taxable item such as “Nature Made Fish Oil Instant Rebate” with a price of “-$2.69″). It seems to display that negative price amount properly in the item’s price field (using parentheses to denote the fact it is a negative amount) but does not appear to be taken into account in a shopping list calculation, before or even after checkout. Is there some way to accomplish this type of configuration? Or better still, to accommodate different locales that may have different methods of applying taxes, rebates or coupons, would you consider adding a feature to allow multiple “Location Settings” to be configured and applied to a shopping list? This would make it easier for people who may shop in different areas that have differing tax policies for how discounts are applied. This would also make it easier to have the amount due at checkout be 100% accurate. Hello Mike, thank you so much for your feedback and such detailed description. Kindly note that we are collecting our user’s feedback to come up with a good set of locale-specific calculation rules. Since this takes quite amount of time, we are currently considering ability of manual adjustments of shopping list total as well as supporting negative prices. Thanks again and please let me know if you have any further questions. In addition to q’s I have already posted, I must join the others in commending you on your application and your responses. As an ex-IT professional I have been there; in the long run you would save a lot of time answering questions if your user doc was a little more detailed. I see that a lot of us are confused on the same things. Stilll it’s a fantastic app – thank you! Now if you could only get that check out feature show us the math …..
Hi Karen, thank you so much for your feedback. I agree that better Doc/Video guides would be much of a help. Thus we are planning to shoot a few more videos and add more details into User’s Guide. 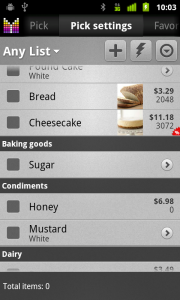 As to checkout total — do you think that total in the bottom of the shopping list is not enough? 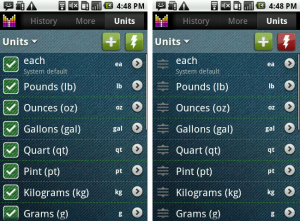 I started playing with the recipe feature and added a few units to support them in the Units section and have some unit property questions. Can you tell me how the Base ratio is used? Is that for metric only, or it usable for english measurements like teaspoon or pint? For Increments, is there a way to represent fractions, like using a 1/8 increment for tablespoon and using a 1/4 for teaspoon? Althea, thanks for your question. Kindly note that base ratio can be used for any types of metrics. The main purpose of base ratio is to have ability to specify unit price and item quantity using different units. It does not have much use with English measurements. 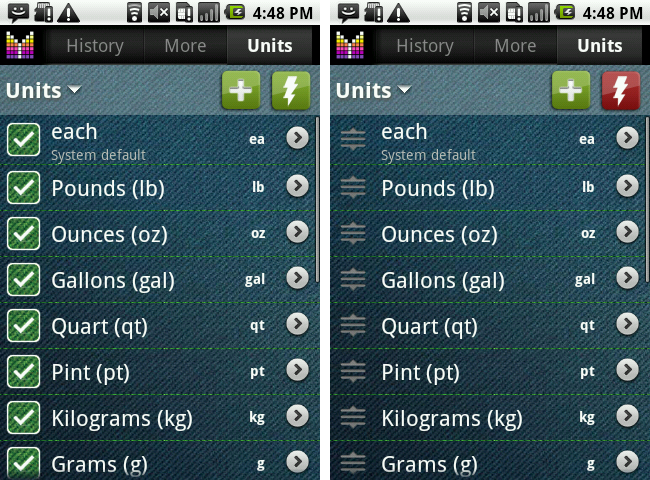 But for metric, it is common to set price per kg while measuring weight in grams. So kg is a base unit for grams with base ratio of 1000. As to quantity increment, unfortunately the only way to set fractions is 0.25 (for 1/4) or 0.125 (for 1/8). However, I will add this under consideration in our plans. Can I use the base ratio in creating units like Cup, Teaspoon, Tablespoon, etc in relation to Pint, Quart, etc so that I can have it modify my pantry? I entered all the relevant information in but when I add an item into my recipe ingredients as a cup rather than a quart, it doesn’t show my stock. I had purchased 1 qt of half & half, but I’m only using 1 cup in the recipe. I’d rather not have to say I’m using 0.0625 qt just to get it to work right. Nate, unfortunately there is no easy way to make Quart and Cup compatible in Mighty Grocery. 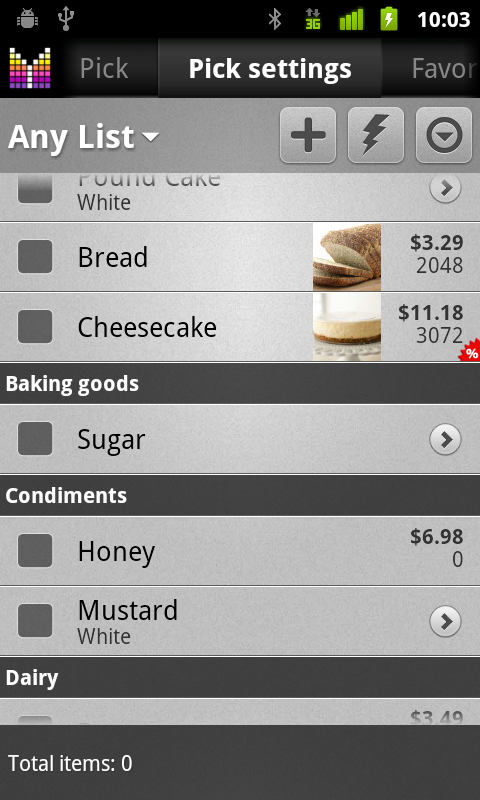 Current app design assumes that you’d use “qt” in your ingredients section. We plan to make things easier soon. Thank you for your feedback. 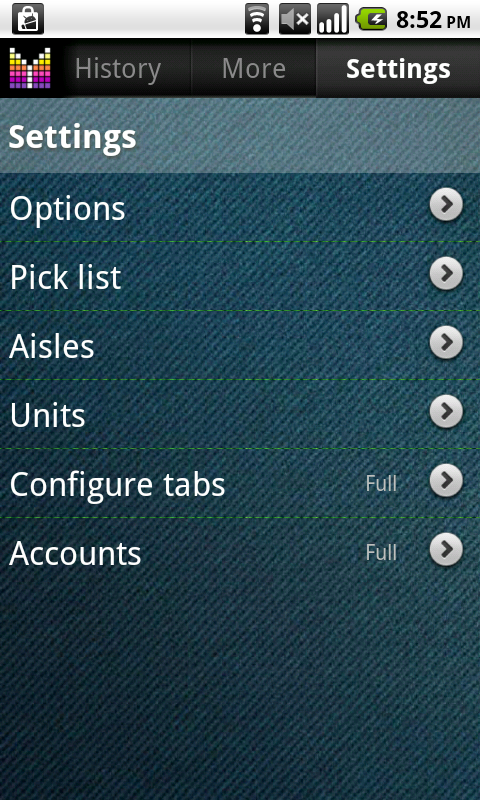 # Open Mighty Grocery and go to Pick list –> Menu –> Import –> Custom. In Russian is not working in Beta14. 2 days already trying to import their lists. List which is registered in the program is imported without any problems, but he did not quite suit me. Based on it has made his and I can not Record. I guess it must be something with data in your CSV file. I could have a look if you send it to hi@mightypocket.com or you may want to split your data in half until you find the failing row. The user guide says to adjust units as you like, but doesn’t give any explanation. I figured how to not show units I don’t use. What I am not clear on is the base units. For instance, if I want the base units of a gallon of milk to be 128 oz, do I make the base unit oz and set the ratio as 128? Or if I want that same gallon’s base to be a quart, do I set the base as qt and the ratio as 4? Or do I need to use decimals? Also, if I want to put an item on my list that is a six pack of 12 oz cans, do I list it as 1 each if I want to order more than one? The unit values are great for comparison of sale prices, but I can’t see how to say I want 4 of those six packs if I list them as 72 oz or 2.25 quarts without doing the math to calculate the total number of ounces or quarts of all 4. The unit values are the only way to determine if one sale is better than the other for different size bottles or packages. Thanks for your help. I love this so far. Just has a learning curve. Hi Kelly, thank you so much for your feedback and your comments. Your assumption is absolutely correct. Ratio should be 128 for Liquid Ounces if you choose Gallon as base units. With regard to your second question, unfortunately, there is no way to compare product prices yet, the math should be done manually. This is going to be addressed in “Compare product price” feature later this year. Please consider BC scanning for coupons, with perhaps an alert flag when a coupon is available for a list item. Wanna go over the top? How about an expiration alert for coupons? Hi Mary, thank you for your feedback. Hopefully, your suggestions will be addressed in the Coupons feature later this year. In a mean time we are collecting feedback on this feature so thanks for writing back! any chance of an option to lock the screen orientation, it’s a real pain when the screen keeps change as you pick things up and load your trolly? Hi Keith, thank you for your suggestion. I am adding this to Under consideration section of our plans. Not sure about specific delivery date, but hopefully it won’t take too long. 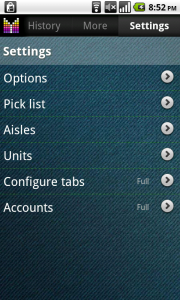 I can’t find Configure Pick list. In settings can’t see where is it? Vitaly, thank you for your question. 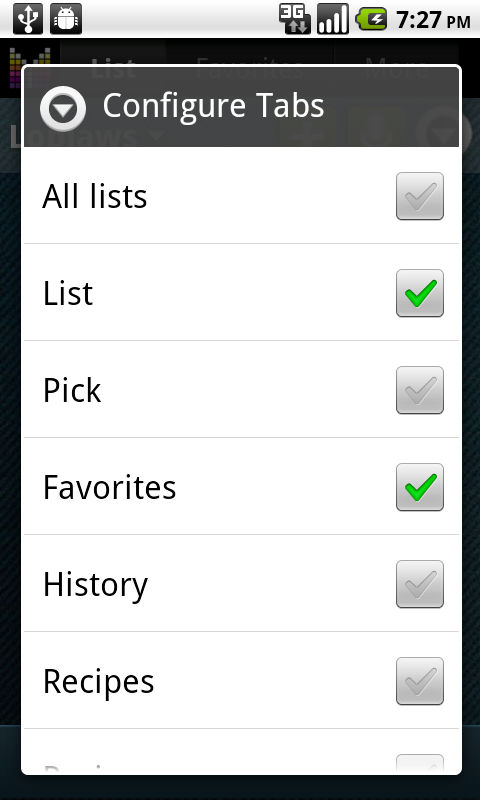 Kindly note that Configure Pick list is available starting Beta 11 update. So please make sure you are running the latest version by checking version label on top of the Home screen. 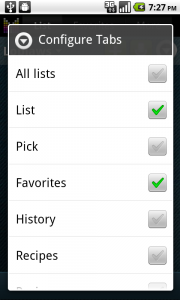 If it’s Beta 11, just click phone Menu button, choose Settings and then tap Pick list (2nd option from top in Full version). Thank You very much for fast support! Great! Vitaly, thank you so much for your feedback! Hi Alex, I didn’t understand how to Import custom product catalog. Is there possibility to load csv file? If I have to add records one by one manually then what the use of this feature? Alexey, thanks for your question. A few more details have just been added to the text above. You may want to have a look at them. 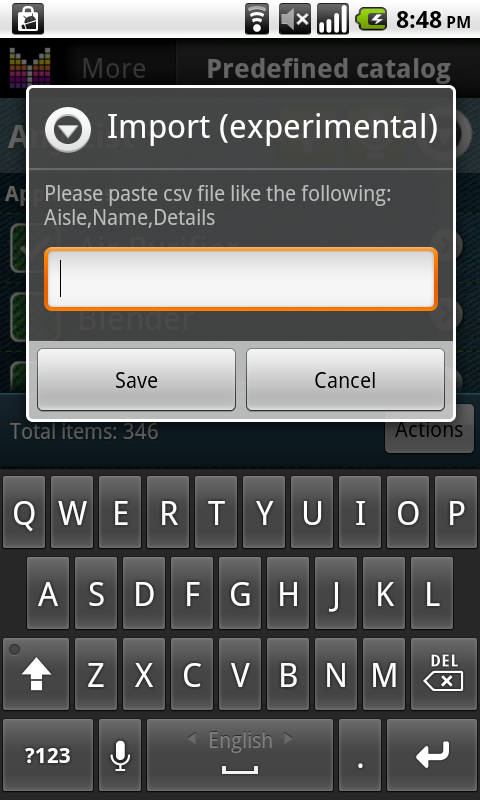 Shortly, to make use of importing custom catalog you need to transfer a csv file to your phone first. It could be USB or email. 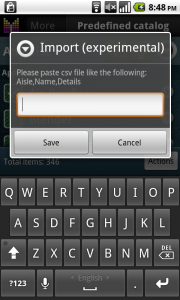 Then you need to open a file, long-press text and select “Copy All”. Then just long-press an edit box on Custom import screen and tap Paste. After clicking Save the app will start importing. Now I got it Thank you Alex! I must first say that your App is the most well thought out, layed out, and written App I have seen. And, this is across the WM, Blackberry, IOS, and Android platforms. It is also one of the most useful Apps I have seen as well. One request I have is that when I bar scan something and the details mode in settings is checked that it also automatically opens the details screen too add quanity and price. 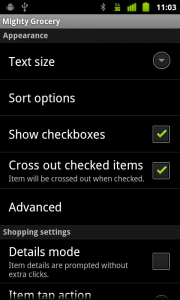 Presently, this checkmark only enables the details screen when one of the other input methods is used. Once again, I must complement you on your App. It really is an amazing App. Hi Jimmy, thank you so much for your feedback. Really appreciated. I agree with your suggestion. 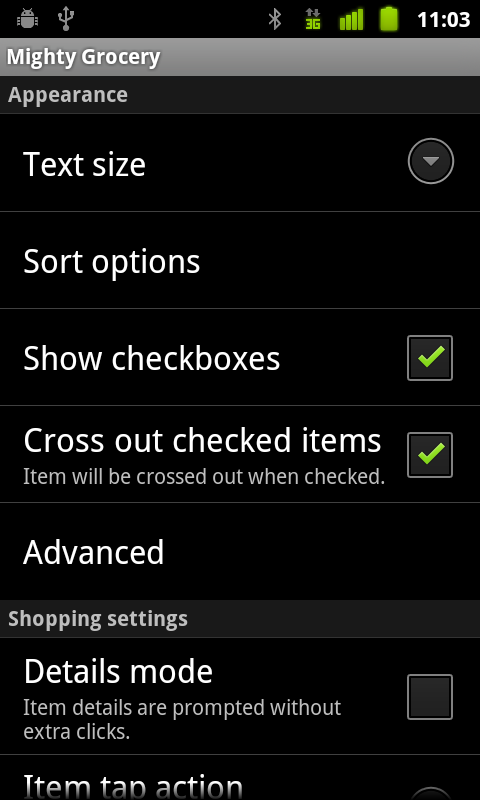 We are going to introduce this and some other tiny improvements to Barcode Scan feature early next year. In a mean time I put it under consideration in our plans. Thanks again and looking forward to hearing from you again.